English nouns tell us who or what we are talking about. Nouns are words that name and classify people, places, things, or concepts. Examples of nouns include mother, child, Mary Smith, parents, beach, mountains, London, Korea, table, chairs, money, time, peace, and ideas. 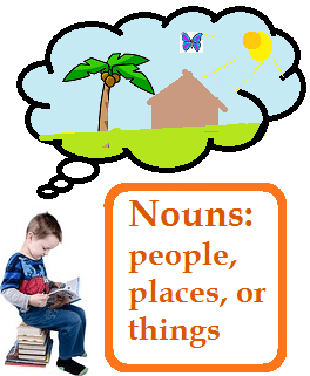 Nouns can be the subject of a sentence (the cause of action) or the ‘object’ that receives the action. In the sentence “Mary hit the ball,” Mary is the subject and ball is the object. In “Tim took Mary to the store,” Tim is the subject, Mary is the object, and store is the object of a prepositional phrase. Most nouns can be counted: two boys, four cities, 100 schools. “Non-count” (or “mass”) nouns do not have a plural form (as normally used). These are mostly abstract ideas (time, money, knowledge, advice, health, happiness, etc. ), liquids (water, tea, coffee, soup, or milk), some materials like wood, metal, or cloth, or tiny things like sugar or grains of sand that we would not count or handle individually. We ask for a leg of lamb, pork chops, beef steaks, or fish fillets. We also talk about the packaging or weight. We want: a pound of hamburger and a box of rice. "How many apples do you have?" "I don't have very many; only a few." "How much milk do we have?" "We don't have much; just a little." "Do you have any extra books?" "Yes. We have a lot. Would you like some?" "Did you have any extra money after you paid the bills?" "Yes. We had a little left. Do you need some for class?" "How much time is left?" "Not much! Hurry!" Quick Quiz: Which of these are Nouns? Did you choose sky, thing, home, boy, door, book, rain, sun, hand, coat, sand, Spain, and flower? The good news is that you don’t need to memorize which words are English nouns or verbs (or both.) Just remember that English is a very flexible language, and notice the way people use it. The more you listen and read in English, the easier it will be to use it correctly yourself. See English Sentence Structure and Word Families for demonstrations of how English nouns and other parts of speech fill their places in sentences. Home > English Grammar Lessons > English Nouns.